Manufacturer of a wide range of products which include nsa flex 40, nsa white, nsa platinum, nsa diamond, nsa gold and nsa no.1 silver. 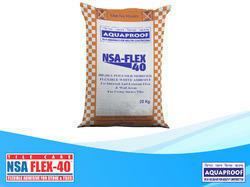 NSA FLEX 40 is a highly polymer modified, flexible, cementatious high performance adhesive for fixing different types of tiles and natural stone on wall and floor where slight movement & vibration is expected. It is flexible adhesive for application on different types of surface. It is ready to use, single component. 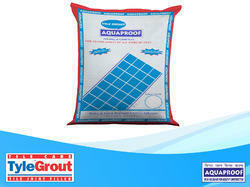 Suitable for different kind of tiles, granite, marble and stone in large formats application. NSA White is a white cement based material for fixing marble stones over the floors and walls. Since marble has low absorption, marble is fixed with neat white or grey cement. When grey cement is used, after some time black or grey specks appear over the marble’s surface. This common problem affects the aesthetic beauty of expensive marble. Since cement tends to shrink, marble fixed with neat cement will detach from the surface very quickly. Neat cement mortar is applied at a thickness of 5 mm-10mm for bonding the marble and so the mortar is not evenly spreadable behind the marble, resulting in hollows spaces. Due to this water leakage may occur. To overcome this problem, NSA White is designed with extra bonding agents and other performance enhancing aids to boost its adhesive properties. NSA White is self curing material than doesn’t shrink and bonding is excellent. NSA White can be applied even at low plaster thickness 2 mm with excellent bonding properties. NSA White stone’s aesthetic beauty of colour is protected with Marble Cement. NSA White is durable and long lasting. 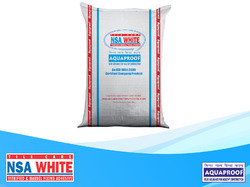 NSA White waterproof’s the surface, it is economical in use. It is easy to use and gives more coverage to mark overall cost economy. 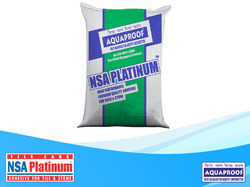 NSA Platinum is a premium White & Grey Cement base highly polymer modified wall and floor tile & stone adhesive specially formulated for fixing tiles for outer wall at high rise building or any type cladding. NSA Platinum water proof's the tile surface. It has very high performance and strength. It is Excellent water resistance. It is highly recommended for outer cladding work. It is Premium grade multi use adhesive. It has Excellent tensile & shear adhesion. It doesn't shrink, as it is self curing material with no care. NSA Diamond is white cement based material for fixing vitrified tiles and glass tiles over concrete or plaster surface. Vitrified tiles like Marbo Granite and Glass Mosaic tiles are non-porous, non-absorbing and heavier thus fixing them with conventional method is not desirable. NSA Diamond is ideal for fixing these with excellent bonding properties. 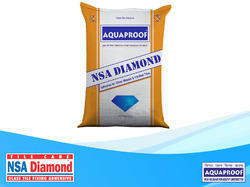 NSA Diamond is having very good bonding and nonporous also. Thus it is deal for vitrified tiles. NSA Diamond water proofs the tile surface. NSA Diamond gives very good coverage. NSA Gold is a cement-based material for fixing ceramic tiles on smooth floors, walls and on existing tiles. It is coarse powder. It is easy to use and very economical. 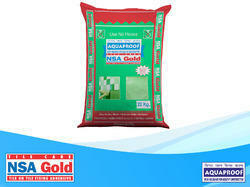 NSA Gold has excellent bonding and water proofing properties. NSA Gold has excellent bonding properties. NSA Gold waterproofs the tiled surface. NSA Gold is a self-curing material and no other extra curing is required. NSA Gold can be applied even at low thickness of 2mm. with excellent bonding properties, hence, is provides more coverage. NSA Gold holds the tile very strongly and thus tiling on the walls can be done in a top-to-bottom manner. 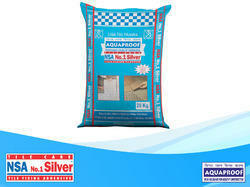 NSA No.1 Silver is a cement based material for fixing tiles on thefloor/walls. It is a coarse powder. It is easy to use and very economical. NSA No.1 Silver has an excellent bonding and water proofing properties. It can be applied, even at low thickness of 2mm, with excellent bonding properties, hence it provides more coverage. It has excellent bonding properties and it is not necessary to hack the floor or use a mechanical key. It waterproofs the tiled floor. It is a self-curing material and no extra curing is required. It stop shrinkages of cement hence stop cracking tiles. Tyle-O-Fix is a white polymer based liquid additive used to make mortars of high bond strength. The mortar so made is waterproof and can be used for fixing ceramic, marble, cement tiles etc. on floors and walls. It is admixture in a cement/sand mortar in ratio of 1:2. It is flexible and resistant to thermal impact shock non-toxic. 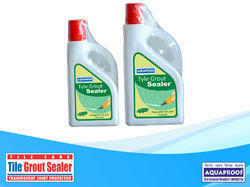 Tyle Grout Sealer creates an invisible shield to repel dirt so it won’t penetrate the unique, non- silicone formula that provides a curable subsurface and a protective barrier against soil on tile and grout in showers and restrooms. Treating bathroom floors with Tile grout seal ensures that surfaces are kept to a high standard ofappearance with reduced maintenance. 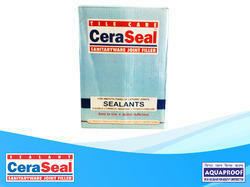 Non-gloss seal for porous grout. Water-based formula is easy to apply. 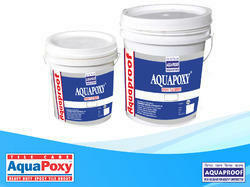 AquaPoxy epoxy grout is a three part general purpose water clean-up epoxy system for grouting most types of ceramic tiles in demanding environments. It consists of epoxy resin, epoxy hardener and a selected colored fillers. Ideal for both interior and exterior application. Cera Seal is flexible, can accommodate movement created by the temperature stresses in long pipes. It is non-shrink, hence makes the joints crack free. It is totally waterproof, hence does not allow any leakages through the joints. It has excellent adhesive properties, hence binds the pipe firmly at the joints. 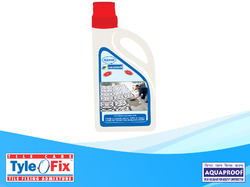 Tyle Kleen is a high quality effective & acid based liquid and degreasing solution for cleaning tiles, wash basins etc as well as plastic/metal buckets of those white/yellow stains which ordinary detergent can not remove. This is an ideal cleaning material forsurfaces before application of epoxy products. 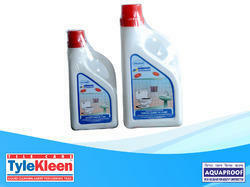 Multi purpose cleaning solution for tiles. Looking for Tile Care ?